That was just one of the pearls of wisdom afforded me last week by 2013 Mongol Derby veteran Shelley Bates, shortly after she informed me that my plan of three clothing changes over my 10 day, 1000 kilometre journey across the Mongolian steppe was far too many–one at most, maybe none, but a change of socks every day, she suggested. What luxury. Waikato man Eion Kemp is always up for a challenge. And in August he'll leave his home in Matamata to compete in the world's toughest horse race, the Mongol Derby. The 1000 kilometre derby, in Mongolia, is run across high valleys and open passes, semi-arid dunes, wetland and river crossings. Temperatures can drop to -8 degrees Celsius and soar to 50deg C in one day. 73 starters representing 24 nations tackled the 120-km CEI 2* endurance event Saturday April 28 at Tryon, North Carolina. 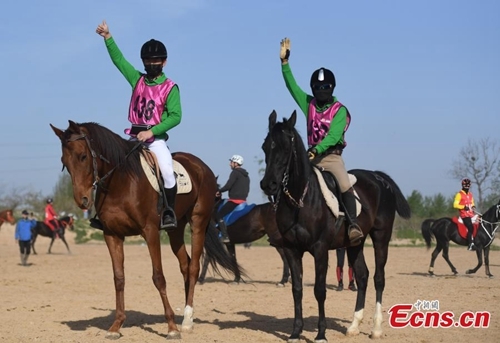 It was the Test Event for the World Equestrian Games 160-km endurance event to be held on September 12. The UAE took the top 4 places, all finishing together in a group, with Sheikh Hamdan Bin Mohammed Al Maktoum taking first aboard Upedro, a 10-year-old gelding, in a ride time of 7:21.44. Sheikh Rashid Dalmook Al Maktoum was second aboard Toumani Eureka, an 11-year-old gelding. Former multiple European and World Endurance Champion Maria Alvarez Ponton of Spain finished 5th riding Upsala El Saad, a 10-year-old gelding, in a ride time of 7:40.41. Canadians Robert Gielen (riding his 9-year-old gelding More Bang For Your Buck) and Wendy MacCoubrey (riding her 9-year-old mare Black Barts Louta) finished 8th and 9th, in 8:52 and change. USA's Heather Reynolds was 10th aboard the 11-year-old mare RTR Rimfires Etta. Ellen Olson was 12th riding the 7-year-old gelding Noslos Tuff Enuff. Kelsey Russell finished 17th riding the 8-year-old gelding Fireman Gold. Melody Blittersdorf finished 20th aboard the 18-year-old gelding Synthetic. The other USA riders who were eliminated were Cheryl Van Deusen riding Nazeefs Flashy Rose, Gwen Gall riding TA Kwik Dance, Jeremy Reynolds riding Treasured Moments, Erin Lemmons-Innes riding Highh Treason, Tracy Hofstrand riding FLF Forever Champion, Erin Champion riding Landroval, Meg Sleeper aboard Syrocco Madrigal, and Holly Corcoran riding Authentika. 24 finished the race, and 49 were eliminated, and consensus is that the trail was tough and the vetting very strict. USA rider Gwen Hall commented: "The hills are relentless and the rains as recent as Thursday evening made footing challenging in areas. Many eliminations due to lameness and despite our riding “back of the pack” the trail beat us today. This trail reminded me of another certain 100 – never hurry, never tarry. I learned a lot on this ride and am thankful for the opportunity to have participated." Crew person Devan Horn commented: "So it turned out to be about a 32% completion rate. I truly feel in this case the vets were demanding perfection. Not 100% perfect and fresh, you were out. Also, the footing was rough being a newly cut trail, which effected a lot of riders." Monte Hermoso, Argentina. Friday 20 and Saturday 21 April 2018. The Argentinean Equestrian Federation celebrated 20 years of endurance with several international racesin the city of Monte Hermoso. Two days of racing was on the agenda and more than a hundred combinations participated. Argentinian entries were joined by riders from Belgium, England, Slovakia, Chile and Uruguay who raced with local horses. On Friday at 6.30 the start for the 160km race was given and an hour later in was the turn for those riding in the 80km juniors and seniors. The beach was the main attraction of the event and also proved the most difficult part of the different loops. THREE local sportswomen are set to put their endurance and horse riding skills to the ultimate test. Riana Griebenouw, Kirsty Masterson and Anri Wolmarans will compete in the 160km South African International Endurance Riding Challenge at the Bona Bona Nature Reserve near Klerksdorp in North West Province. The 160km ride will be divided into six legs: two legs of 40km each and four legs of 20km each. After each leg the horse will be thoroughly inspected by international accredited veterinarians, who decide whether the horse is fit to continue. “This is not only a fitness challenge, but also a test of mental strength for both horse and rider,” says Wolmarans. Masterson will ride Delmar Nadra, an 8-year-old mare bred by Daan Landman from Tsitsikamma, while Wolmarans will saddle up 8-year-old gelding Delmar Hasan - also bred by Landman. Griebenouw will take on the challenge on the back of Welbech Hurst Lienka, a 7-year-old from the Welbech Stud in Middelburg. They will, along with seven other riders, represent the Eastern Cape at this annual challenge. Other team members are Leanne Wels, Antoinette van Zyl, Peet Diedericks, Megan Botha, Nicara Diedericks, Marti Geldenhuys and Xander Diedericks - all from different areas in the Eastern Cape. Berlin: Oman’s Royal Cavalry won the first and third positions at International Babenhausen Endurance race in Germany. It was a 160 km race and included 6 phases, which was held under the supervision of International Equestrian Federation. Adil Said Al Bulushi secured the first position on mare Toscane owned by Royal Cavalry, while Rayan Al Mubte from Saudi Arabia came second on the mare Victoire, and Hisham Saleh Al Farsi came third on mare Un Dia owned by Royal Cavalry. The race was launched at 6am before sun rise which caused some vision difficulty for riders. THE Ravensthorpe Equestrian Club will be hosting a two-day endurance ride over the June long-weekend (June 1-4) for distances of 160 kilometres, 80 kilometres, 40 kilometres, 20 kilometres and 10 kilometres. Experienced and novice riders and their horses alike will be taking to the Ravensthorpe ranges to conquer the hills and take in the views riding on well-marked, dedicated tracks. Based at the newly refurbished Ravensthorpe Equestrian Club grounds, participants will ride out on both the Saturday and Sunday on a number of different tracks, most of which will head towards and around the range. Endurance riding is an equestrian sport embodied by the motto “to complete is to win”. La Voulte sur Rhône. France. Saturday 24 and Sunday 25 March 2018. Every year, the ‘La Voulte’ endurance ride marks the beginning of the Rhône-Alpes district endurance season with a national and international ride held in the southeast of France. Desert endurance racing in the Middle East continues to exact a heavy toll on horses, four years on from what should have been a watershed moment for the sport, according to the group Clean Endurance. The group says it is dismayed that, four years after the Endurance Strategic Planning Group (ESPG) set out a blueprint for change, there have been no concrete signs of improvement in the FEI’s Group 7 region, in the Middle East. The FEI formed the ESPG in 2013 amid growing concerns about horse welfare, doping and rule-breaking. Delegates included representatives from Switzerland, the United Arab Emirates (UAE), the European Equestrian Federation, the FEI Endurance Committee and FEI headquarters. All had agreed, according to Clean Endurance, that, globally, all efforts had to be made to reduce the numbers of horses testing positive for prohibited substances and suffering injuries. The ESPG, after months of consultation, presented 41 recommendations to the FEI Sports Forum in April 2014. “The ESPG’s clear-cut approach gave campaigners cautious hope,” Clean Endurance said. Four years later, Clean Endurance has revisited the recommendations. It believes that half of them were never adopted. Others, it says, have been only partially executed so far. "Endurance Horse Podcast - Where you get to share your adventures of riding good horses through beautiful country"
Taking advantage of the growing popularity of podcasts, Christina Hyke, an endurance rider from the Midwest region launched the new Endurance Horse Podcast on March 14. Inspired by a running podcast that she listens to, The Extra Mile, Chris thought it would be nice if there was a similar podcast for horse people. "Specifically endurance horse people," Chris said, "where we could keep track of each other's success and challenges, and encourage each other." As a photographer, Chris is good with Photoshop and Lightroom, so she thought she might be able to figure out how to put a podcast together. Her first recording, which became her first introductory podcast, was recorded while on horseback in the Wisconsin woods. Chris's first full episode, released March 27, features short stories from a variety of endurance riders, from beginners to a World Champion (Becky Hart); riders from the US, Canada, Great Britain, New Zealand; Arabian riders to other riders of other breeds (Palomino, Morgan, Mustang, Quarter horse, Appaloosa, Thoroughbred, Miniature); and riders with old horses and young horses. The episode also includes a piece from a distance driver. "16 people, 8 horse breeds, and 4 countries is a great start," Chris said. Would you like to participate? Endurance riders from around the world are encouraged to submit an audio recording. "Tell us about yourself and your horse and what you're doing, and if you're conditioning, what techniques you're using, what tips you might have on electrolyting, hauling long distances, anything related to camping. What your hopes are. Doing your first LD? Stepping up to 50's or 100's?" Share your experiences on the trail or about the rides you've done. Chris describes herself as an equine photographer, wife, mother, friend, and lifelong horse woman. Her first introduction to endurance riding was a clinic called "A Taste of Endurance Riding" - which was a 5-mile intro ride that she won on her horse. "I know, that's not even a conditioning ride… but it definitely was a taste of endurance riding because of the people. It was a potluck, it was educational, everybody was friendly, it was fun, it was wonderful. It gave me this overall feeling for the vibe that the sport gives here in the Midwest, which is super supportive. That's how I knew I was going to get into endurance riding. "The reason I'm doing this podcast isn't so much because I'm qualified to do so, though I wanted to do some good in the world and bring our endurance family closer together." New episodes of the podcast will be released once a month. and subscribe to "Endurance Horse Podcast" on iTunes. If you’re a fan of the award-winning Netflix series “The Crown,” you probably think of HRH Prince Philip as, at best, merely tolerating the horses so adored by his wife Queen Elizabeth. But in reality, the Duke of Edinburgh, a rider and carriage driver, presided over the Fédération Equestre Internationale from 1964-1986 and is credited with developing the concept of a World Equestrian Games in 1982. In 1984, the FEI General Assembly chose Stockholm to host that first WEG, which would take place in 1990. It’s fitting that the idea came from royalty, as nothing like it had been attempted before. The Swedish Equestrian Federation established a staff of 30 people who worked for five years in preparation for the Games, and they were aided by more than 2,500 volunteers, many of whom were set up to guard the horses. The event was deemed the “Horse Festival of the Century,” and a huge clock pillar in Stockholm counted down the days until the Games.